This is an outfit I've been wearing to work recently, we don't really have a dress code so I'm free to be pretty casual and wear what I like. This New Look skater skirt is the perfect length for work, most skater skirts just about skim your rear which is never a pretty sight. When did everything get so short? 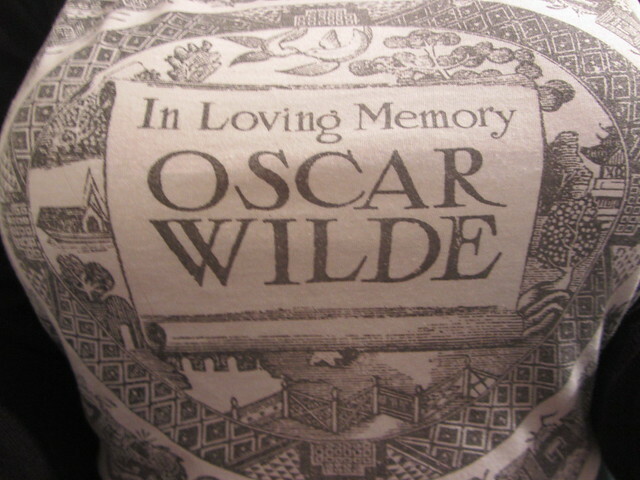 Wearing this t-shirt always makes me check out some Oscar Wilde quotes and boy does he have some good ones. The t-shirt is from one of my favourite brands Orphan's Arms and you can get this print on a jumper too. 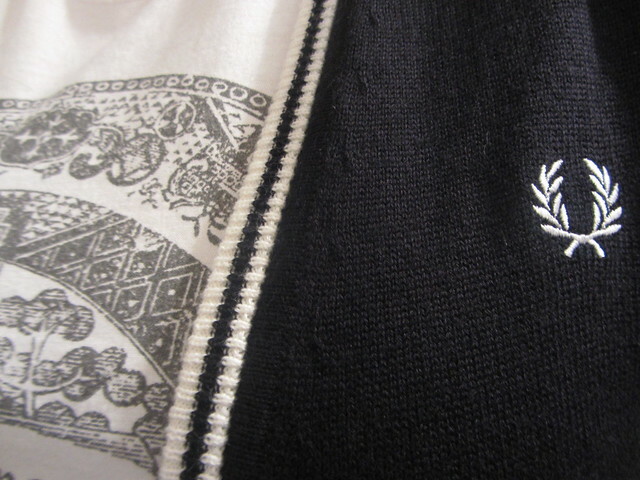 I picked up my new cardigan in the Fred Perry sale after #cardiffmeet on the weekend. It's very thick and cosy and is going to be a staple in my workwear wardrobe this winter. Looking forward to pairing this with a white shirt buttoned all the way up, a black skirt and Dr Martens. My boots have barely left my feet the past few weeks. I've worn them to work, gigs, when walking my dog and around on the weekend. They are the perfect pair of studded black boots and there's plenty of room in them so you can pop a pair of socks on to stay warm without any rubbing. They are from Shoe Zone who also stock some lovely creeper style shoes, flats and Dr Marten style lace up shoes. I'm currently on my way to London to wander around some museums, grab some lunch and head to the #AxParty. Wish me luck because I'm probably going to get lost in the Big Smoke..
Loving the cardigan, looks super cos, as do the boots. Enjoy London, super jealous of all you headed to the party tonight. Thanks Chloe! The cardi is nice and warm for winter. I need that tee-shirt in my life! 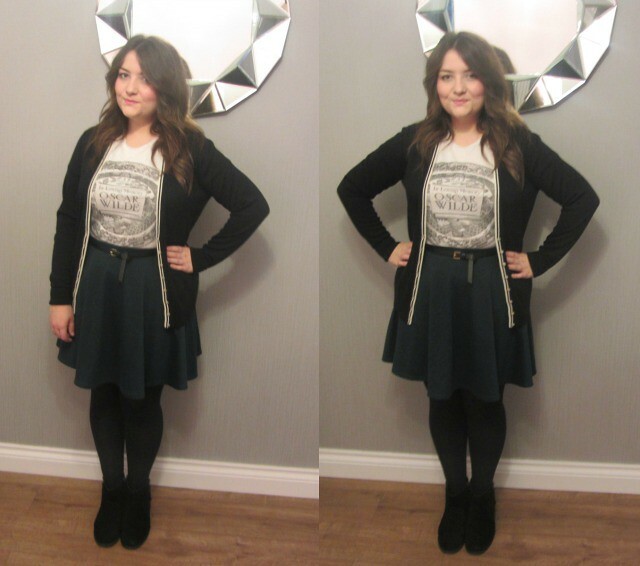 Such a good outfit, I'm recently been living in the same tee-shirt, skirt and cardi combo. I understand what you mean about them getting so short though, I have this lovely one from Urban Outfitters but it barely covers my bum... I'm not tall either, but I wander if it's because I've got a fair bit of bum for the fabric to cover! Love the boots! Have just been browsing their website and might just have to take a trip into town tomorrow... Oops! Unze offers a wide Collection of Women Shoes, Unze offers more than 10,000 Ladies Shoes styles and unique designes.